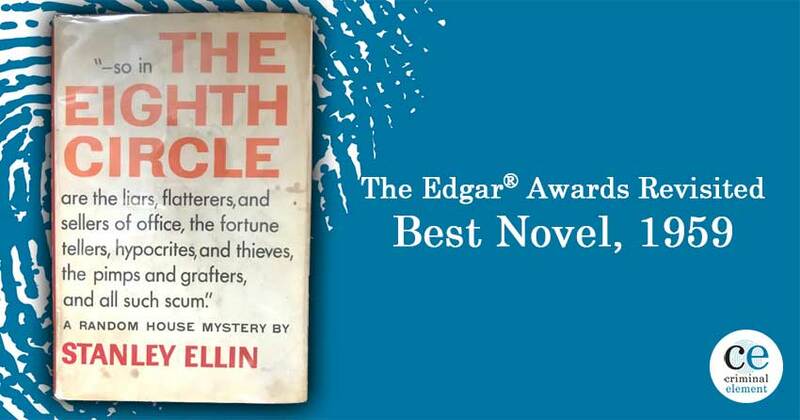 We're revisiting every Edgar Award winner for Best Novel, and up next is 1959's winner The Eighth Circle by Stanley Ellin. Joe Brosnan reviews. 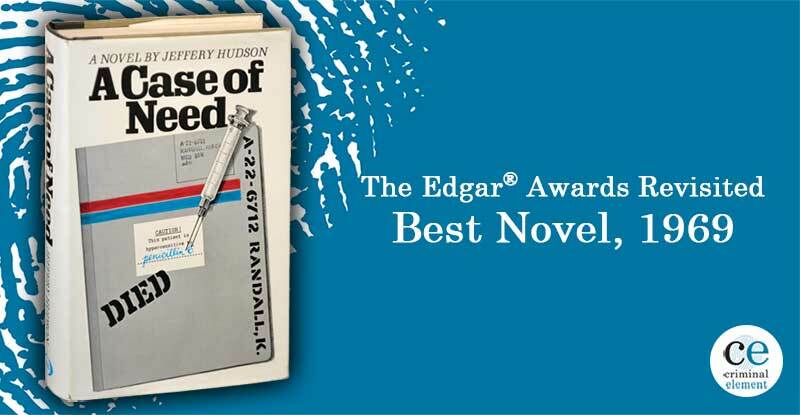 When we conceived our Revisiting the Edgar Awards series, our goal was to hopefully shine some light on a list of (possibly lesser-known) books deserving of praise while also treating these books like time capsules: once-buried containers full of bygone ideals and preconceptions reflective of the time in which they were published. So when looking back at 1959’s winner, it’s important to rotate between these two hats when analyzing the book. 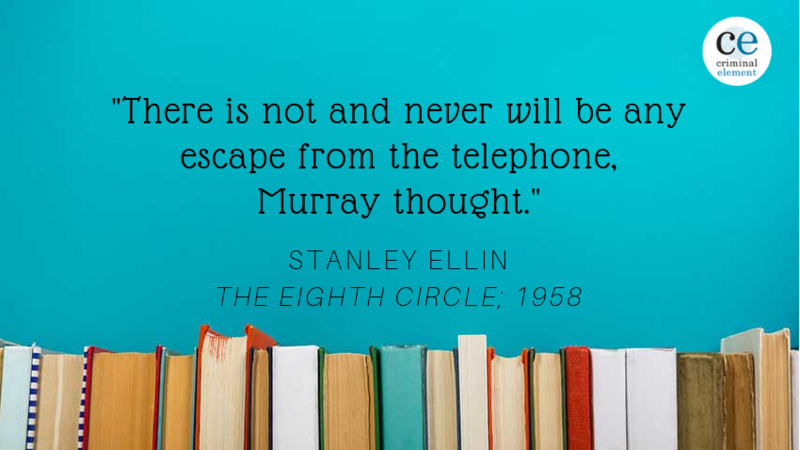 The Eighth Circle was published in 1958 by Random House. Its author, Stanley Ellin, was already a powerhouse in the mystery community, albeit in the short-story realm. 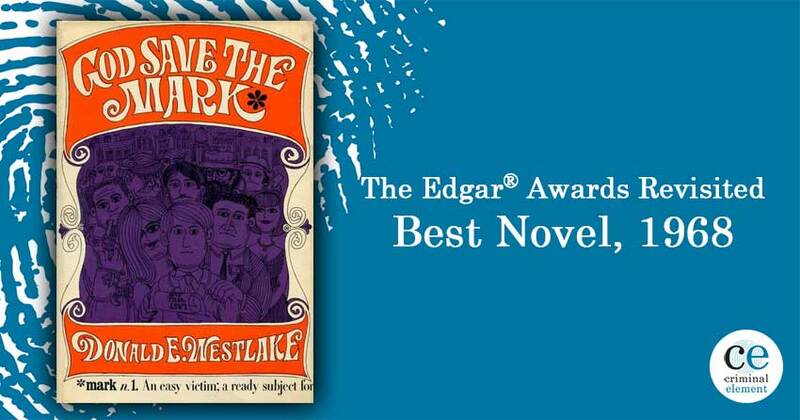 With a nomination for Best First Novel in 1949 for Shoot the Works, and two Best Short Story Edgars already under his belt (In 1955 for “The House Party” and in 1957 for “The Blessington Method”), his win here for Best Novel would cement his legacy. (He also racked up another five nominations all the way through 1984.) Ellin would go onto publish four short story collections and 12 novels, and in 1981, he’d serve as Grand Master. Ellin was also the guest of honor at the 1979 Bouchercon held in New York City. Stanley Ellin was a perfectionist, working slowly and deliberately, producing a page of typescript on a good day. He admitted to having rewritten the opening paragraph of a short story as many as forty times before going on to the next paragraph and polishing each subsequent page in similar fashion before preceeding further. It is possible to write short stories in this fashion, and Ellin consistently wrote the best mystery short stories of his time. His very first published story, “The Specialty of the House,” endures as a classic, although it is probably less surprising to today’s reader simply because so much fuss has been made about it. But all of Ellin’s stories are wonderful. He managed only one a year, sent each in turn to Ellery Queen’s Mystery Magazine, and never had one rejected. He received more financial remuneration, if less critical acclaim, for his novels. (He did not write them as slowly and laboriously as the stories. You can’t.) An early private-eye novel, The Eighth Circle, impressed me when I read it years ago. His later novels never worked terribly well for me, but the short stories are timeless, and a national treasure. All of the above information I learned after I read The Eighth Circle. I wanted to go in with a clean slate: No preconceived notions. No assumptions. No lofty expectations. I was pleased to learn that the book was not only a private eye tale, but also one set in New York City—the city I live in, grew up in, and whose history I’m well versed in. (Shout out to the Bowery Boys podcast!) Also pleasing to learn was that The Eighth Circle was the first in a series, so there wouldn’t be any missing backstory in my reading experience. Ellin’s prose is sharp and poignant, and he imbues his main character, Murray Kirk, with a certain self-aware point-of-view that makes you want to genuinely hear what he is thinking. Kirk—in a refreshing twist on the P.I. trope—isn’t down on his luck. He isn’t struggling. His detective business thrives, built upon a sterling reputation as an agency that honors its clients’ privacies and refuses to sell dirty details to the tabloids. Paired with a group of savvy investigators, they find themselves permanently atop a very short list of reputable agencies. And Ellin seems to be aware of this change in the trope, as Kirk meets multiple people who are shocked to learn that he’s a private eye. Like us—the readers—they expect the life of a private eye to be one full of thrills and violence, and they expect him to look disheveled and hardened rather than well-groomed and handsome, as Kirk is. It’s a refreshing change too, as it saves us from having to listen to Kirk drone on about his self-worth and wondering if he’s good enough—a tiresome theme present in a lot of noirs. A little about Kirk: originally planning to be a lawyer, Kirk graduated from law school and even took a job as a law clerk at a firm downtown before becoming disenchanted with industry. The Eighth Circle opens with Kirk interviewing at his would-be agency, and he cites money as his main motivator for leaving. Unsurprisingly, but not before being made to sweat a little, Kirk is hired. And then after a much-appreciated jump in time, he’s running the show. And that brings us to the main plot of the novel: the Lundeen case. Lundeen, a midtown police officer, has been arrested—accused of taking graft from a bookie operating nearby Grand Central. It’s the age of NYPD corruption, and Lundeen is instantly lumped together with all of the other crooked cops the city has to offer. But Lundeen’s lawyer, an acquaintance of Kirk, is convinced of his client’s innocence and begs Kirk to investigate. Kirk is hesitant at first until he meets Lundeen’s wife, Ruth Vincent. And here’s where we must inevitably discuss the sexist undertones not only present in Ellin’s novel, but in the world at large in the 1950s. My biggest complaint with this book is that Kirk, an otherwise interesting and multifaceted character, is reduced to horny, pathetic man when around Ruth. Ruth—naturally a noir-trademarked drop-dead vixen—becomes the reason Kirk takes on the case. He plans to prove to Ruth that her husband is indeed a dirty cop. Then, he’ll be there to comfort her. It takes creeping to the max, and it casts a dark mark on what otherwise would have been an enjoyable character. And it’s not that a skeevy, manipulative character can’t be present in fiction—the new age of domestic suspense has given these characters a permanent outpost—but it’s the way Kirk’s actions and reasoning are made to seem perfectly normal and okay that leads me to balk at this book. The girl was more than pretty; she was astonishingly beautiful. Ebony-dark hair, long-lashed blue eyes, camellia skin—or, Kirk wondered, was gardenia supposed to be the word for it. Whatever it was, it was incredible that a cop, a dumb, dishonest New York cop should ever have come into possession of anything like this. And here, Kirk thought, we have another member of the cult, another one of that jolly band of middle-aged intellectuals who got through the Depression with their pride in one piece, and who wistfully look back on it now as the Great Adventure. He had met others of this breed before, and found them as readily identifiable as only cultists can be. Full of talk about that bright time when they were all paupers together, when Ideas Not Money was the common currency, when there was an Intellectual Ferment in the Air. 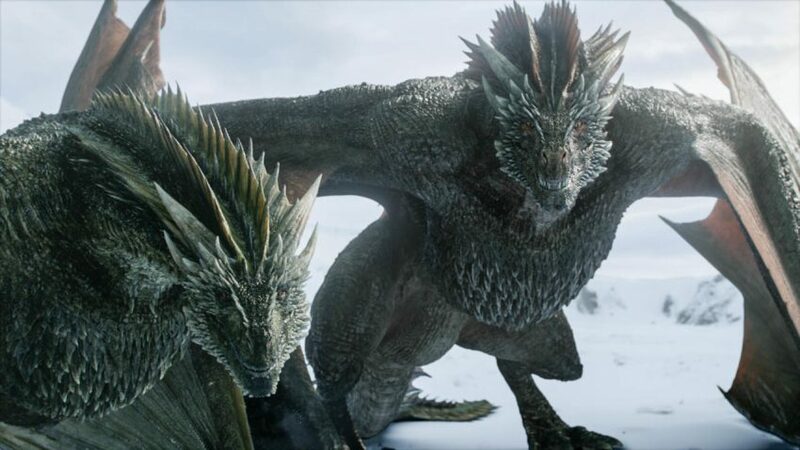 Full of talk about the snows of yesteryear, and never asking what had become of the old men who were paid ten cents an hour to shovel it away. If you want to condemn The Eighth Circle, passages like the first one are easy to find and put into evidence. And if you want to sing its praises, the sections like the latter are plentiful enough that you’ll find yourself appreciating Ellin’s prose and ability to just plain write. For me, it was a mixed bag; a decisively well-written novel with some clearly outdated notions. It won’t be my last Ellin story—I’ll probably seek out some of his short stories next—and I’m glad I can say I’ve read him. —so in the eighth circle are the liars, flatterers, and sellers of office, the fortune tellers, hypocrites, and thieves, the pimps and grafters, and all such scum. By putting this on the cover, Ellin makes it clear where he’s bringing us: hell. It just looks different depending on who’s visiting. There were three recipients of The Raven Award: Lawrence G. Blochman (for his long and distinguished service to the MWA), Frederic G. Melcher (on his retirement after 35 years with Publishers Weekly), and the one and only Franklin Delano Roosevelt (posthumously awarded the Reader of the Year; the award was accepted by Eleanor Roosevelt). Rex Stout, of Nero Wolfe fame, won the Grand Master Award. The Defiant Ones was awarded Best Motion Picture. The Western Printing and Lithographing Company won the Book Jacket Award for their work on Dell covers. Best First Novel was awarded to Richard Martin Stern for The Bright Road to Fear. Thanks again for joining us as we work our way through this list. Make sure to stop by next week when we enter the 60s with Celia Fremlin’s The Hours Before Dawn. Find it Friday. @Jinpa: Indeed I did. Thanks for calling that out. Ruth Vincent isn’t Lundeen’s wife but his fiancee. How far Kirk’s attitude to women reflects his own faults rather than the assumptions of the time is another matter. The moment when the reference to the circles of hell becomes relevant also discloses that another of Kirk’s assumptions about women was wrong.